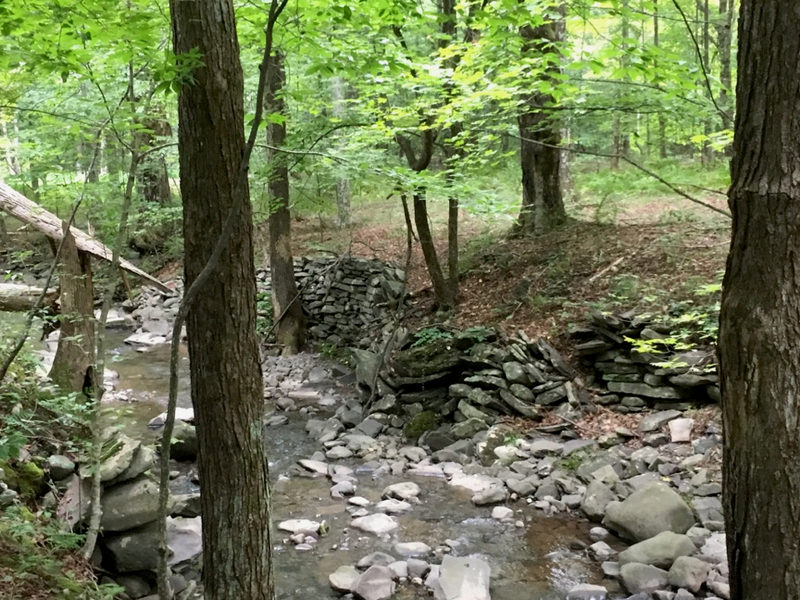 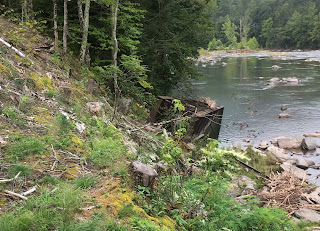 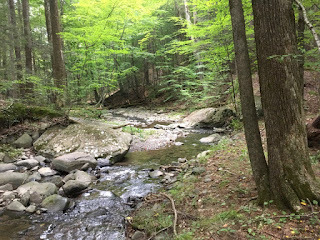 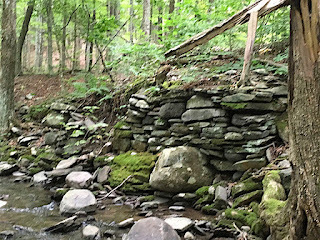 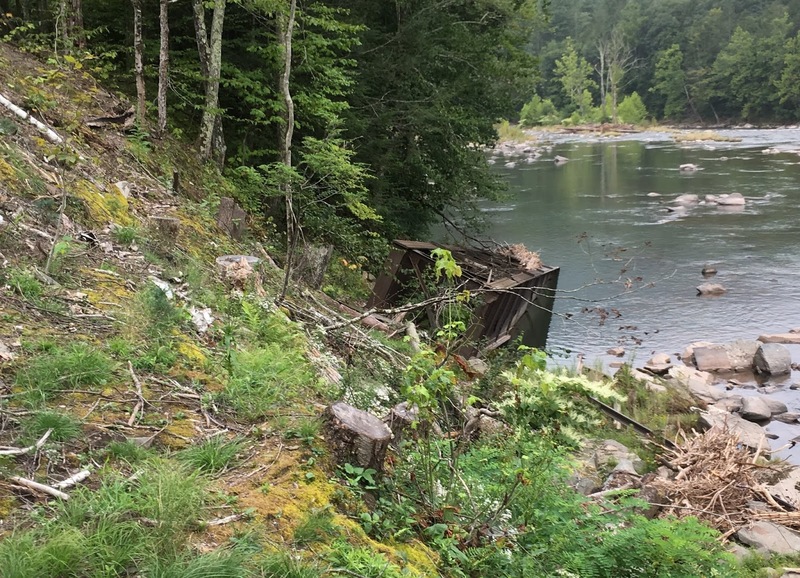 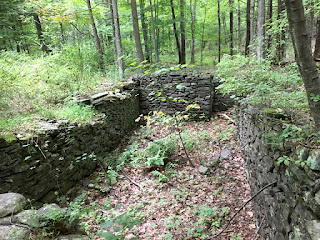 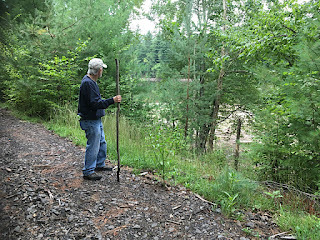 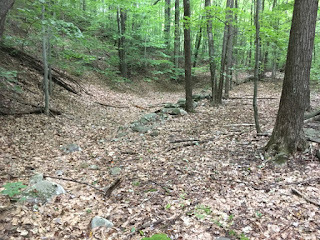 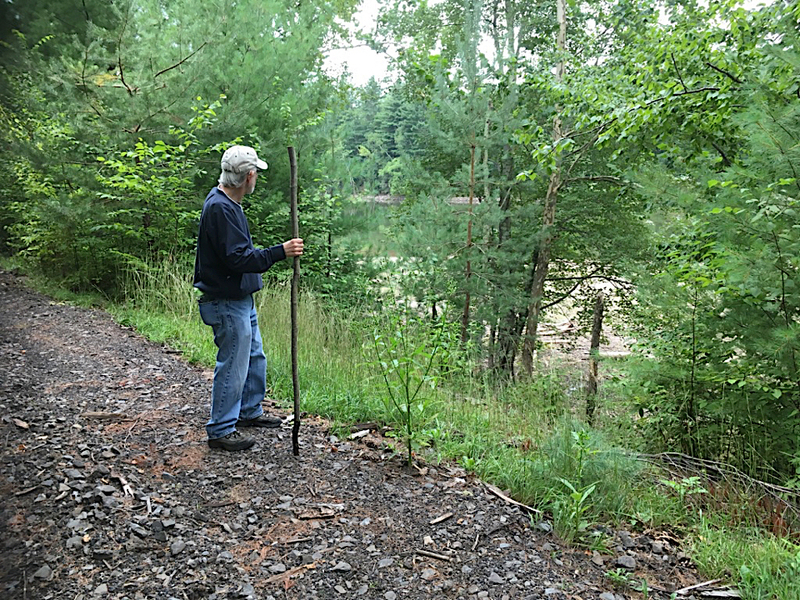 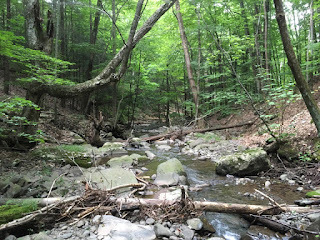 On Friday, my friend Michael Adams joined me for a trek into the woods at West Hurley, NY to look for the fallen railroad bridge. 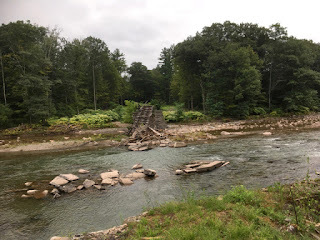 It was a gray and cloudy day but fortunately we only had to deal with a bit of drizzle. 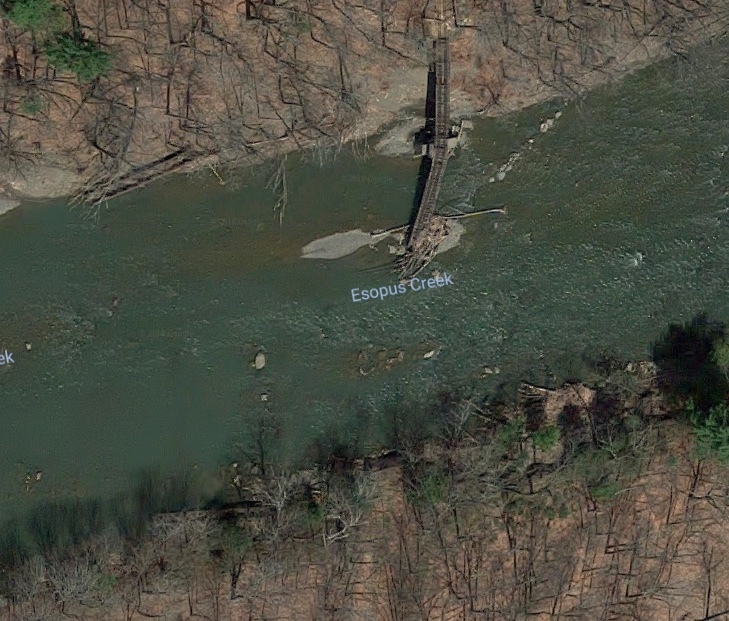 The railroad bridge was destroyed in 2011 by Hurricane Irene but its ruins are visible from a Google aerial. 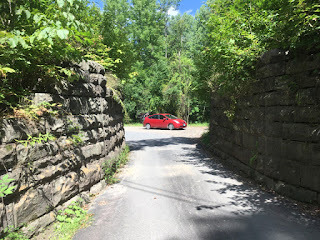 There's no road or path that leads to the bridge but I determined from aerial views that if one follows the stream bed from the nearest road, you will eventually come to the ROW. 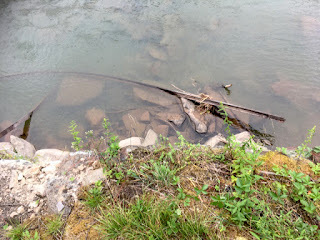 So we bushwhacked in and had to cross the rocky stream quite a few times. 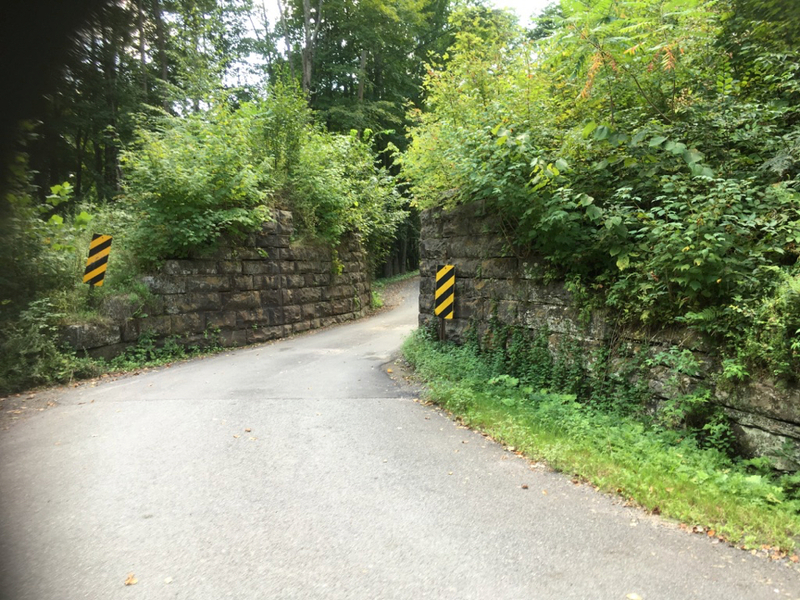 ... and abutments to a long gone small carriage road bridge. 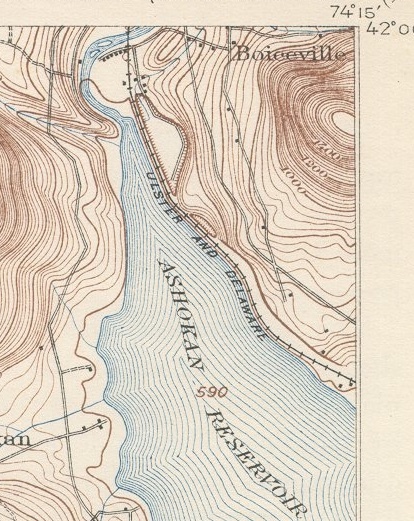 A 1905 topo map indicated there were houses in the area. 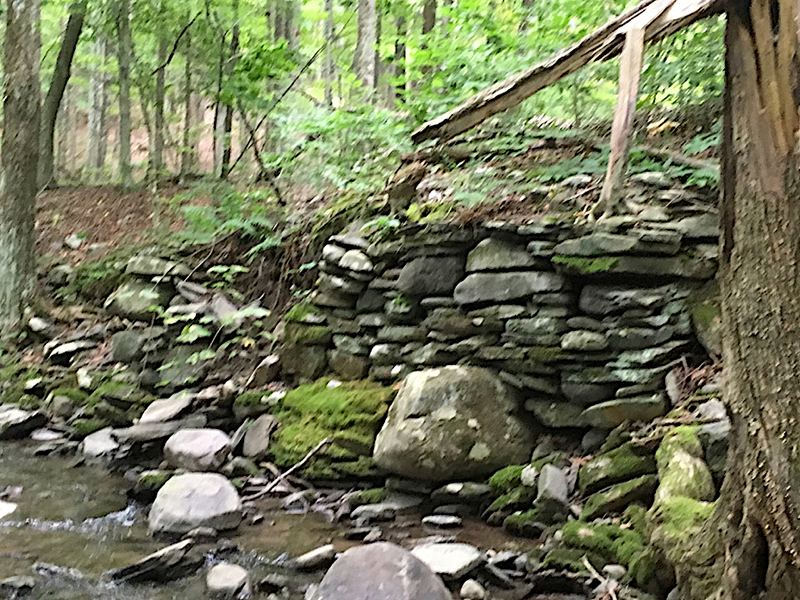 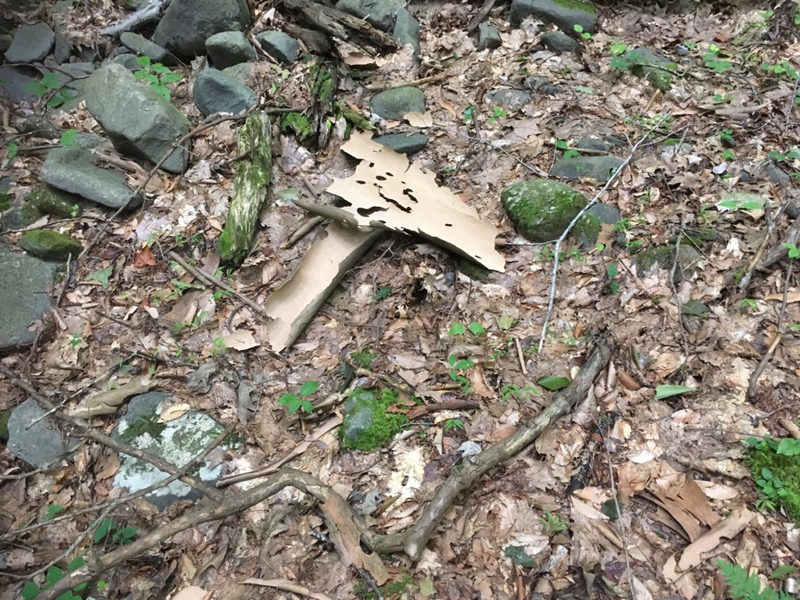 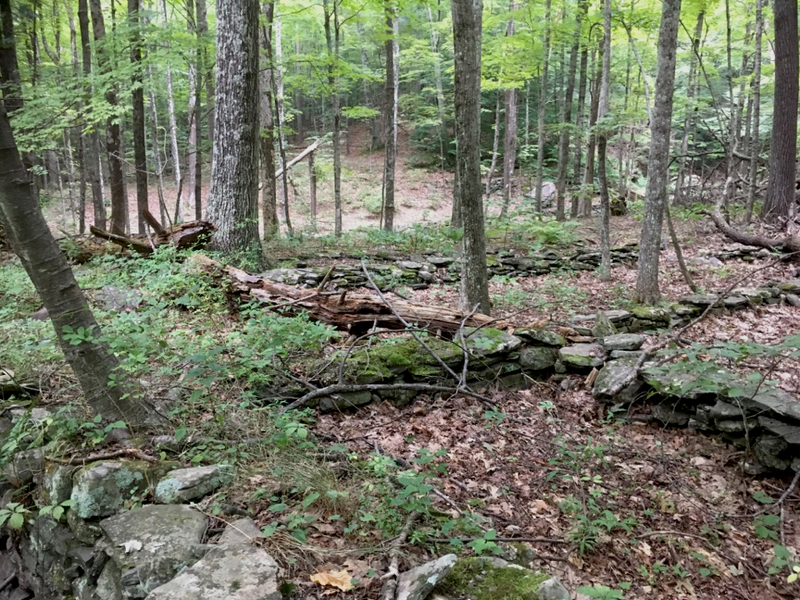 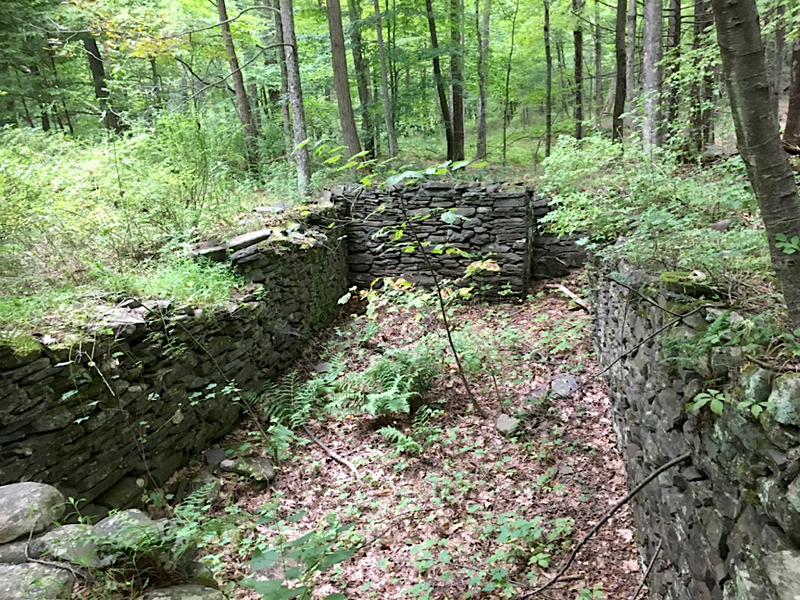 As I was hoping to see some old foundation ruins, it was pretty exciting to discover them. 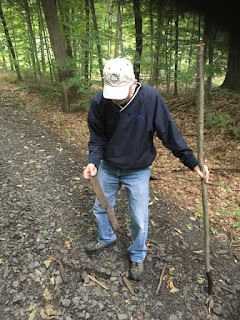 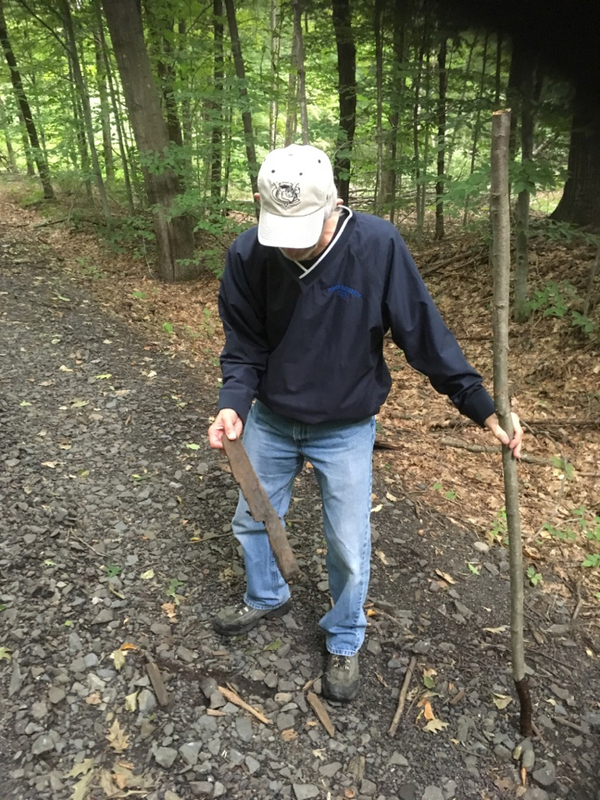 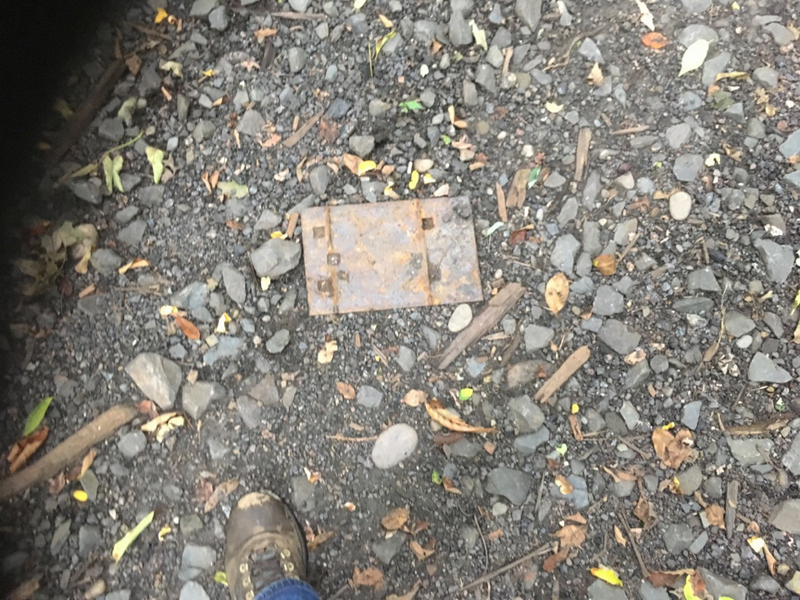 ...Mike picked up a piece of a railroad tie. It was kinda cool to find a mile marker - I believe that signifies 21 miles from Kingston (where the line originated). 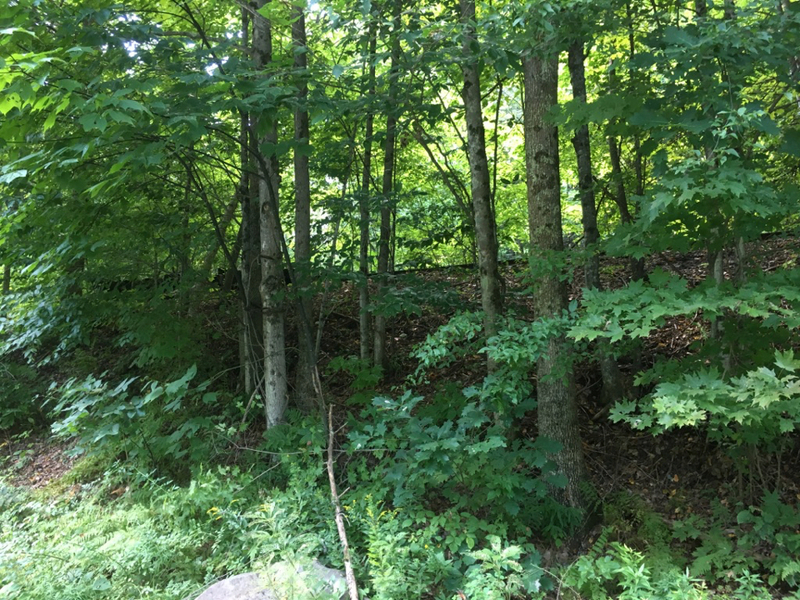 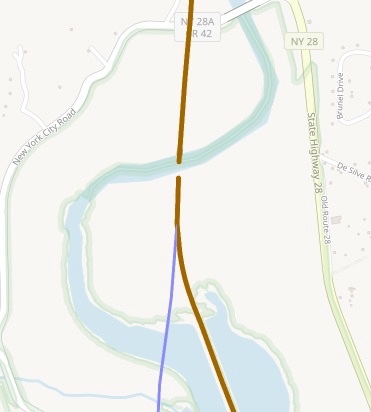 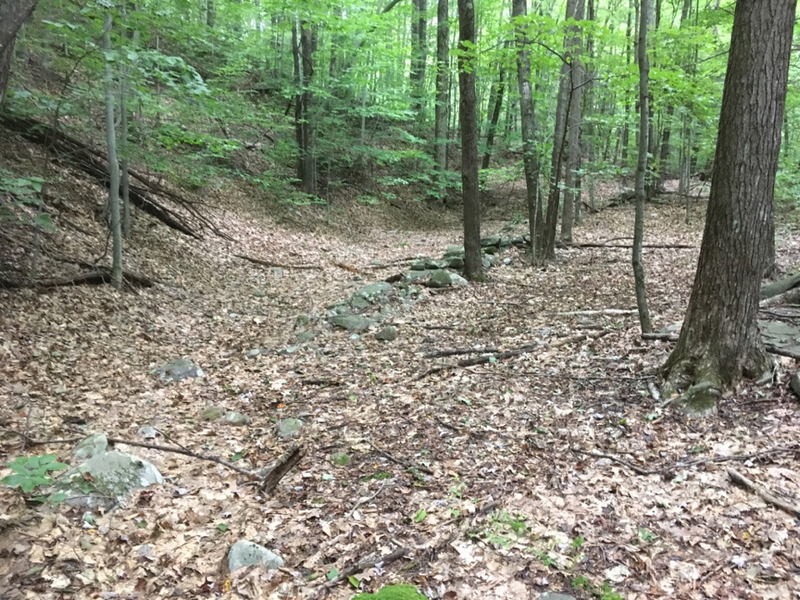 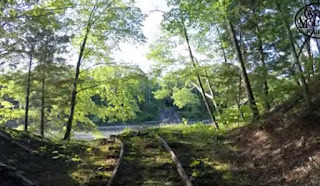 I was hoping to locate where the prior route of the ROW branched off (blue line) but after decades of nature's regrowth I never found it (see About the Railroad below for further details). 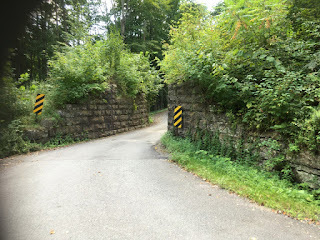 Once we got to the causeway section and saw water on both sides, we turned back and..
...made our way to the fallen bridge. 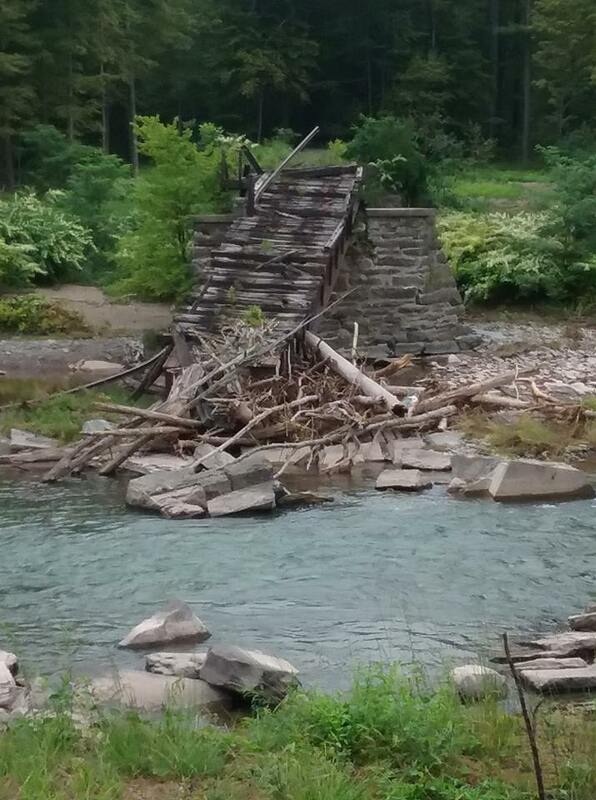 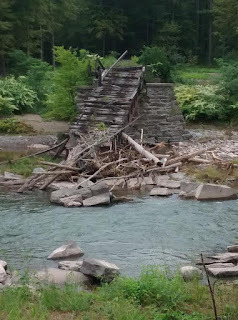 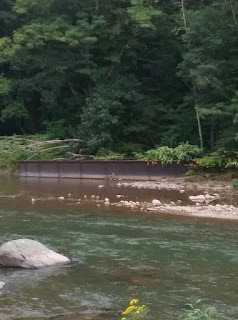 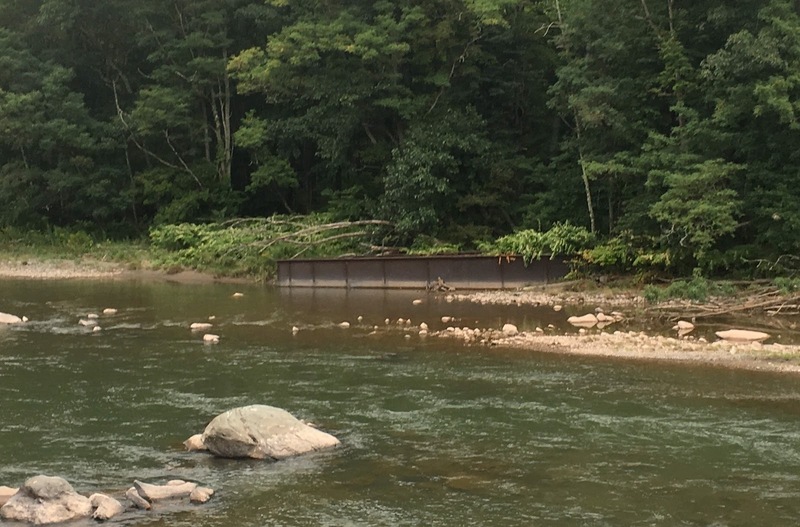 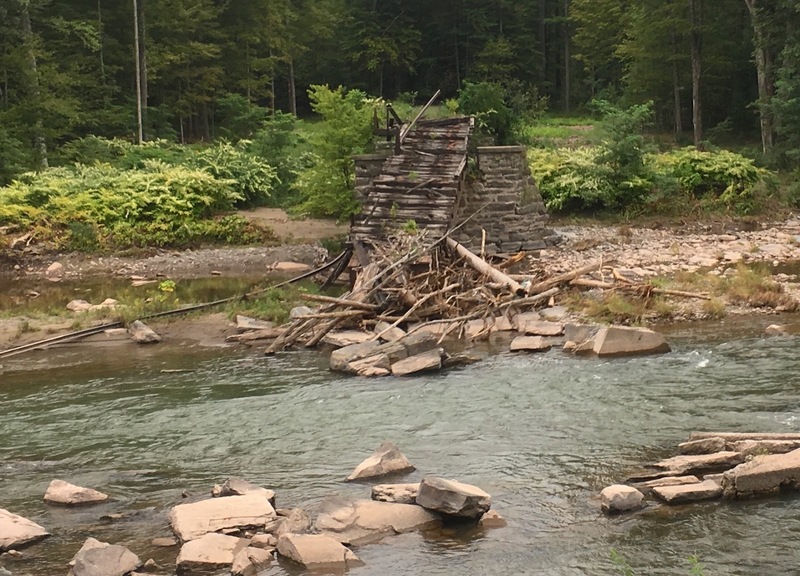 It was interesting that the trees were cut down here..
As mentioned above, this bridge was destroyed in 2011 by Hurricane Irene. 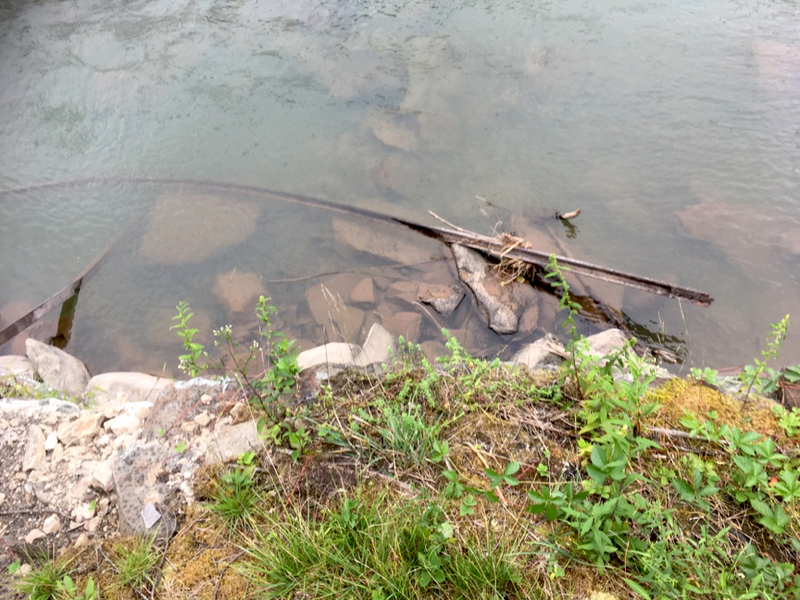 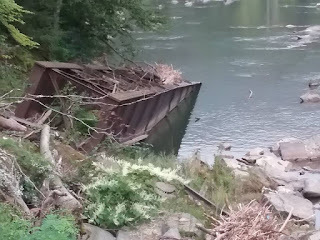 In the water below us, rails snaked thru the river like wet spahgetti! 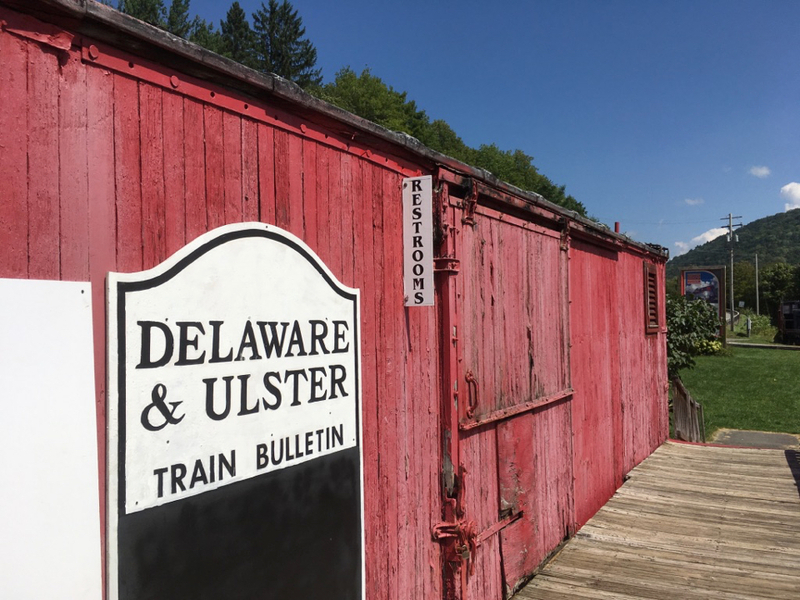 The Ulster and Delaware Railroad (U&D) was chartered in 1866 as the Rondout & Oswego, and reorganized in 1872 as the New York, Kingston & Syracuse, it became the Ulster & Delaware in 1875, and was completed to Oneonta in 1900. 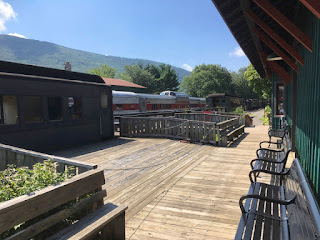 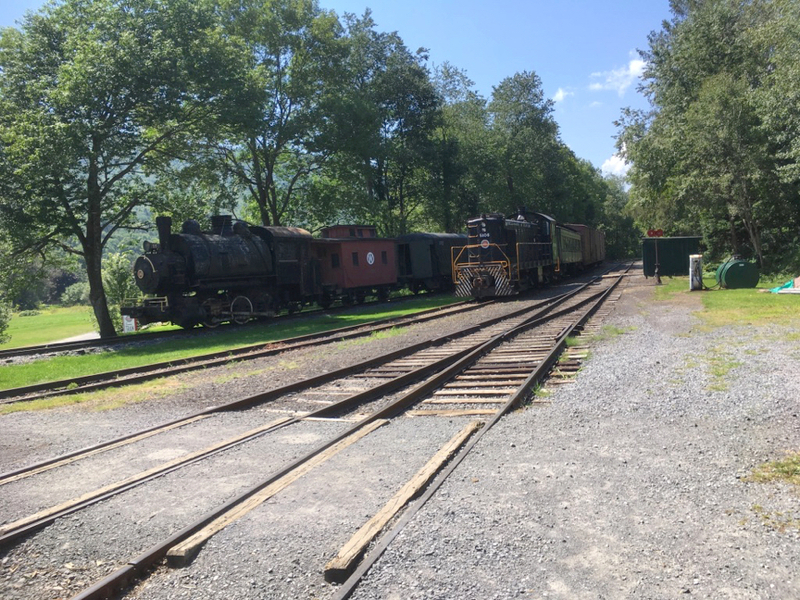 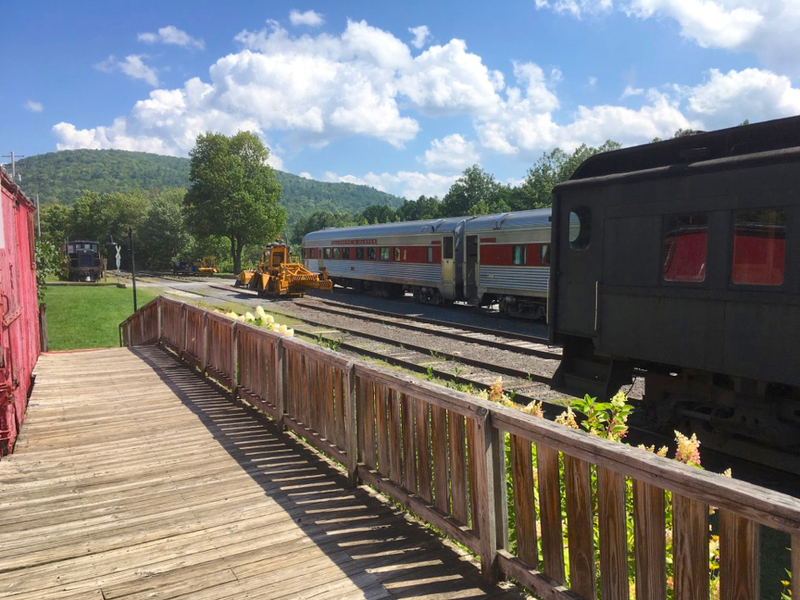 Called the “Up & Down” by locals... stiff grades, horseshoe curves and babbling mountain brooks made the railroad a picturesque scenic ride and key to the development of much of the Catskill economy. 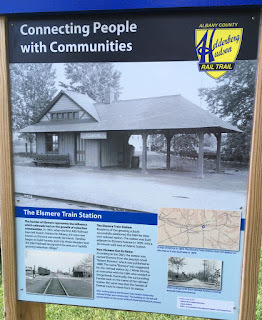 The railroad thrived into the World War I era, especially on tourist passenger traffic, milk, and coal, and began to fade with the coming of the automobile and the truck in the 1920s. 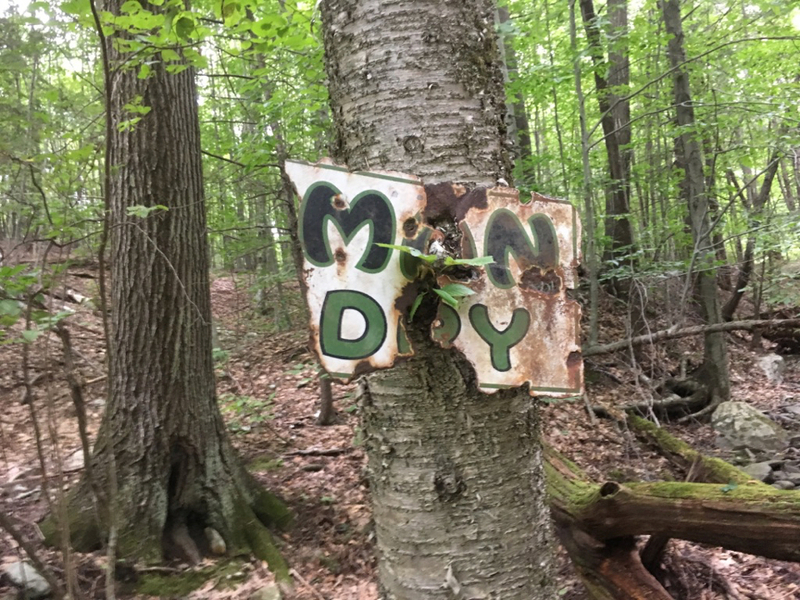 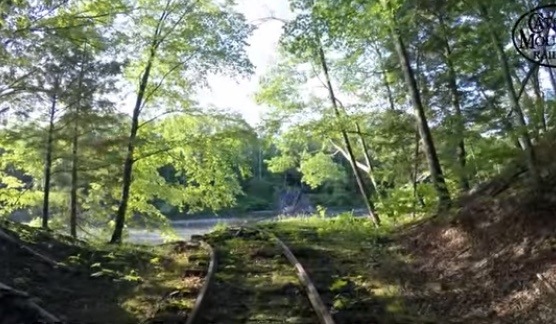 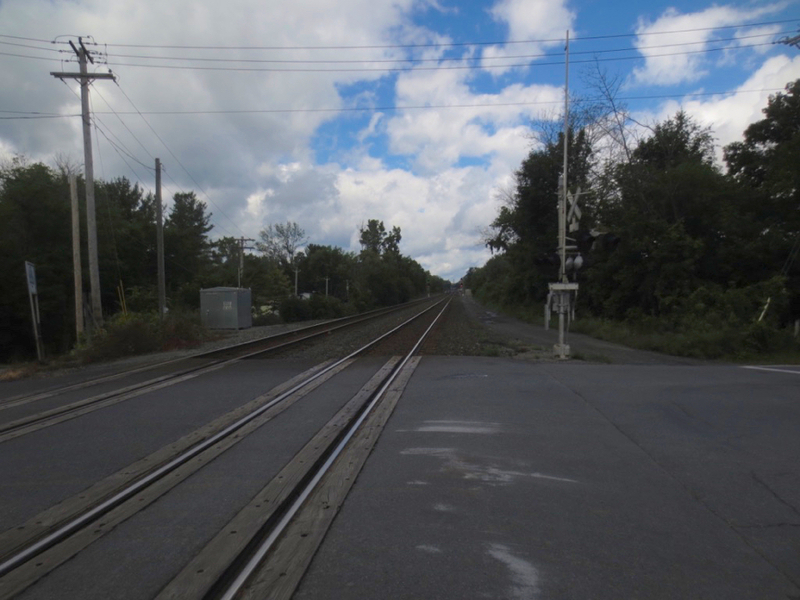 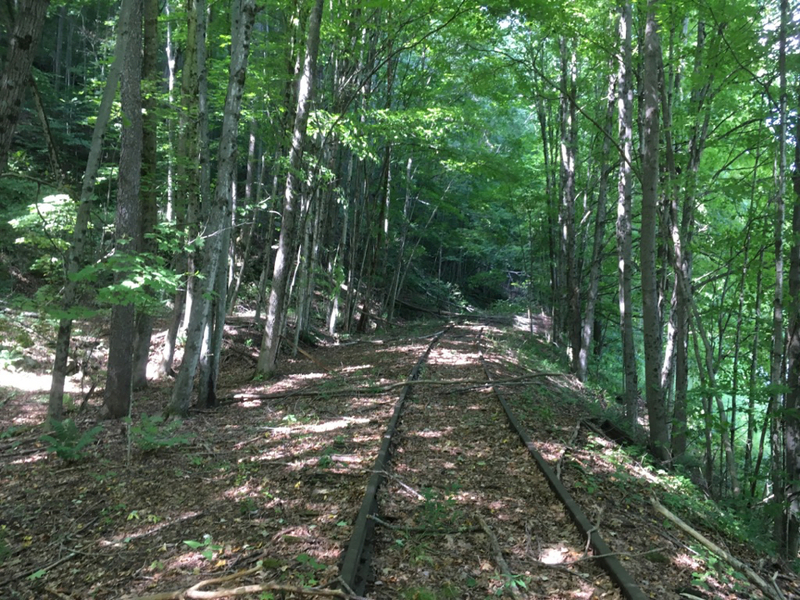 The line later become the Catskill Mountain Branch of the New York Central and was finally abandoned in 1976. 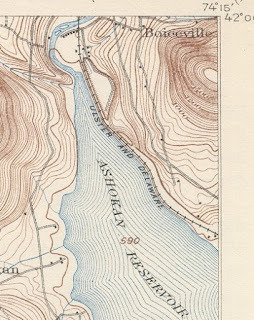 Between 1908 and 1912, the railroad carried supplies for the construction of the Ashokan Reservoir, part of the system of reservoirs feeding New York City. 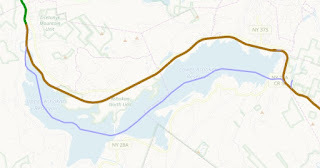 When the reservoir was completed, nearly 12 and a half miles of the U&D were relocated to compensate for the old route that was soon flooded out. 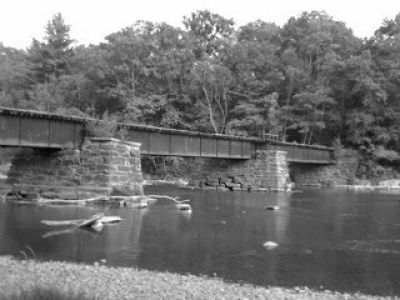 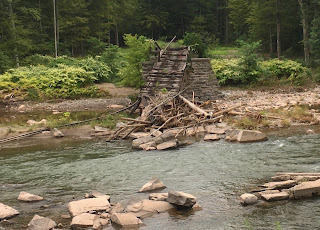 Great Photos of the Bridge "Before and After"
At its greatest extent, the U&D extended from Kingston Point on the Hudson River, through the Catskill Mountains to its western terminus at Oneonta. 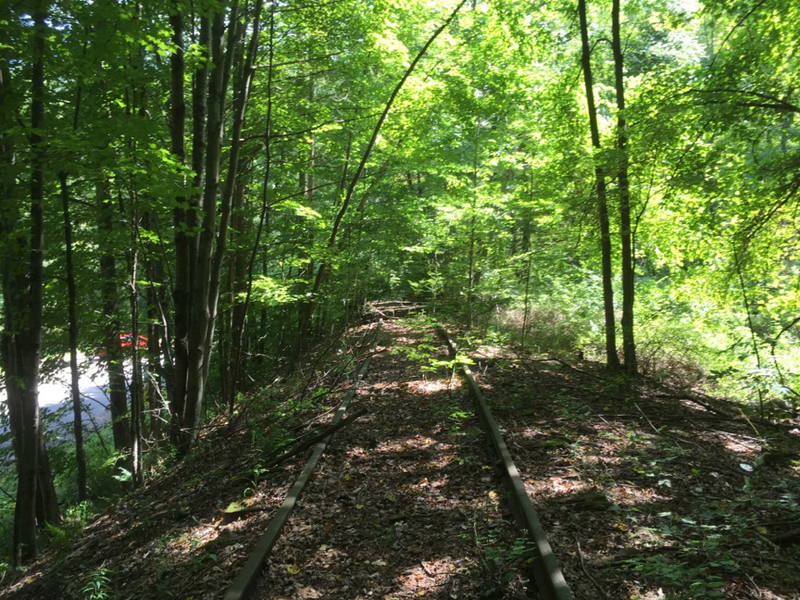 Great write up about the history of this section of track. 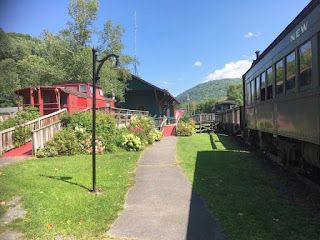 Note This is the tourist train out of Kingston based on former Ulster and Delaware ROW - not the original narrow gauge Catskill Mountain Railway out of Catskill NY. 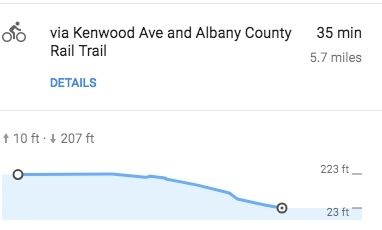 The heat finally subsided and it was a beautiful day for a ride! 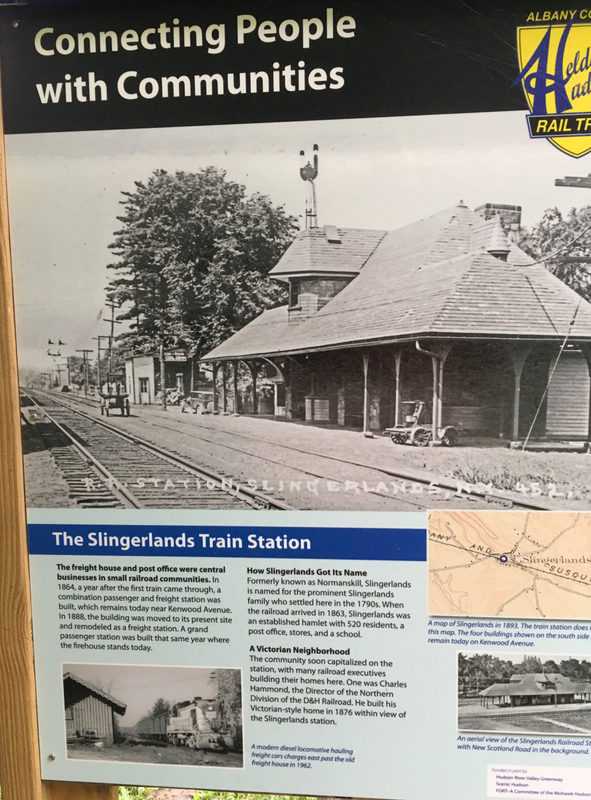 I started the ride in Slingerlands and rode down to the end of the trail. 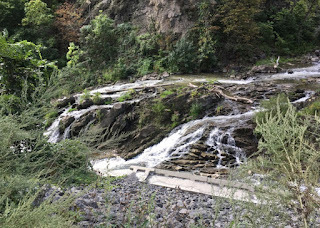 The nicest part is of course the stretch in the gorge by the Normanskill Falls/Rapids. It's an easy ride with a barely noticeable grade. Near my starting point was the old freight station - how cool! 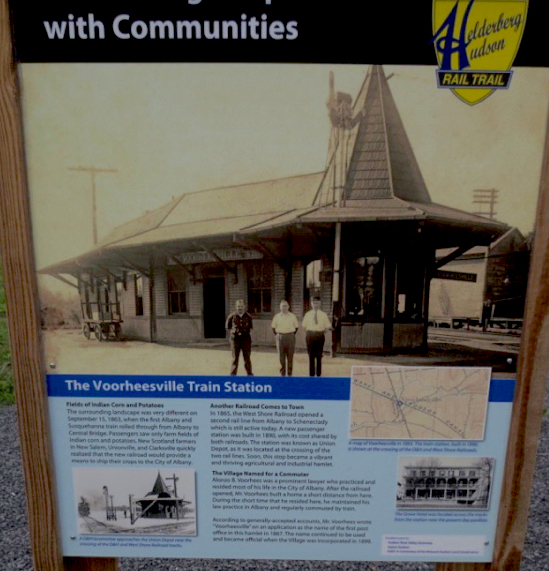 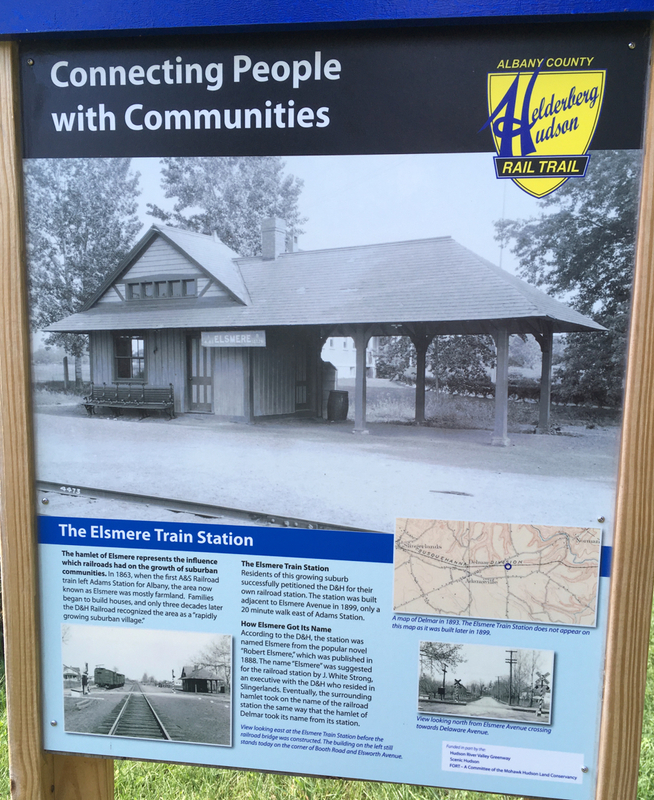 I was very impressed with the occasional signs that detailed the former railroad history and its train stations. 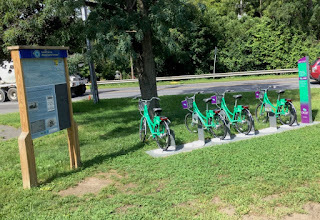 At the bottom of the trail there are even CityBikes available! 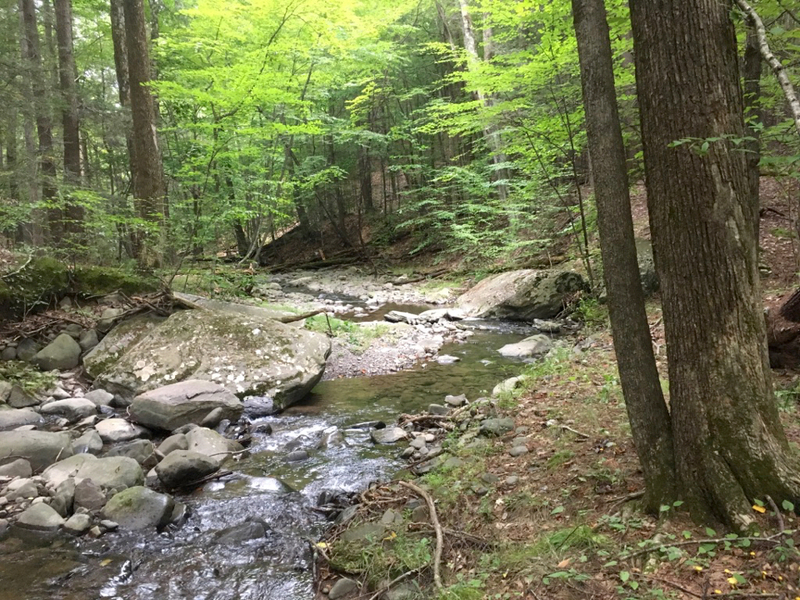 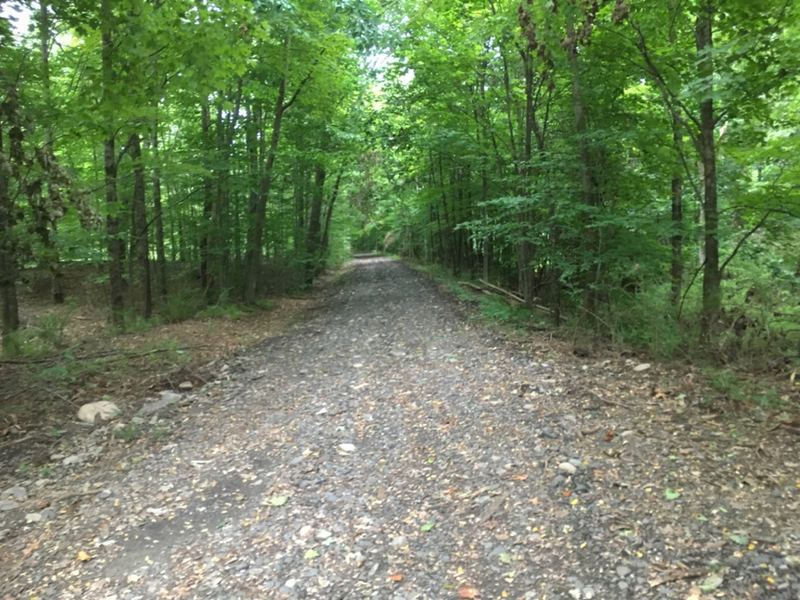 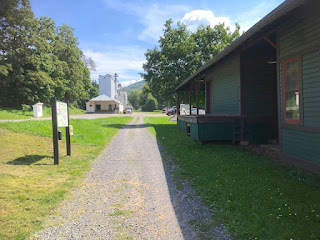 From my online research I expected the trail from Slingerlands to Voorheesville to be rough gravel and/or grass but it has been fully paved and was a breeze to ride! 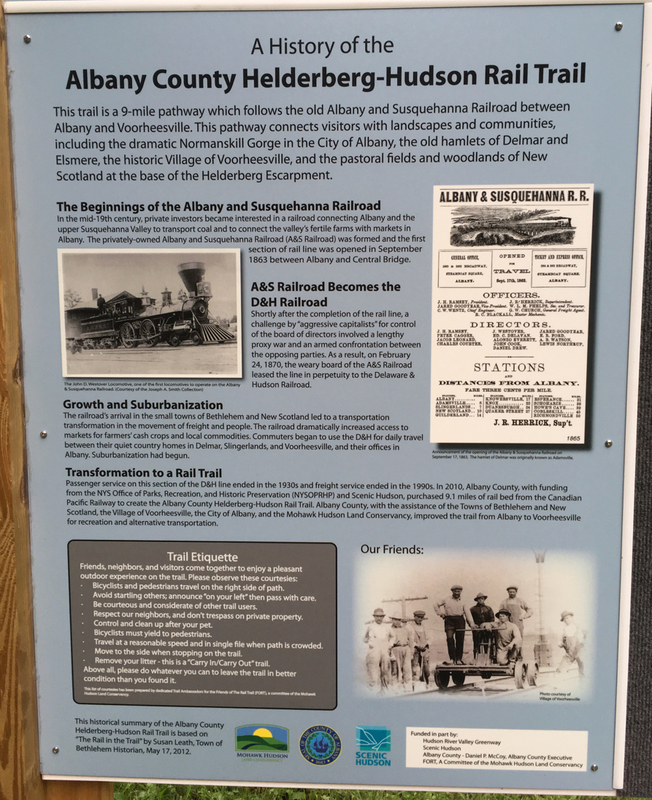 The Albany and Susquehanna Railroad (A&S) was a 6 ft (1,829 mm) broad gauge railroad from Albany to Binghamton, New York, operating 1851 to 1870. 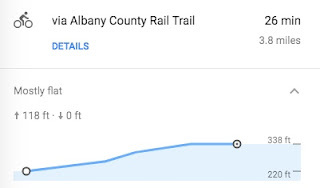 Construction began on April 19, 1851, from Albany to Schoharie Junction, New York, a 35-mile (56 km) stretch that required 12 years to complete. 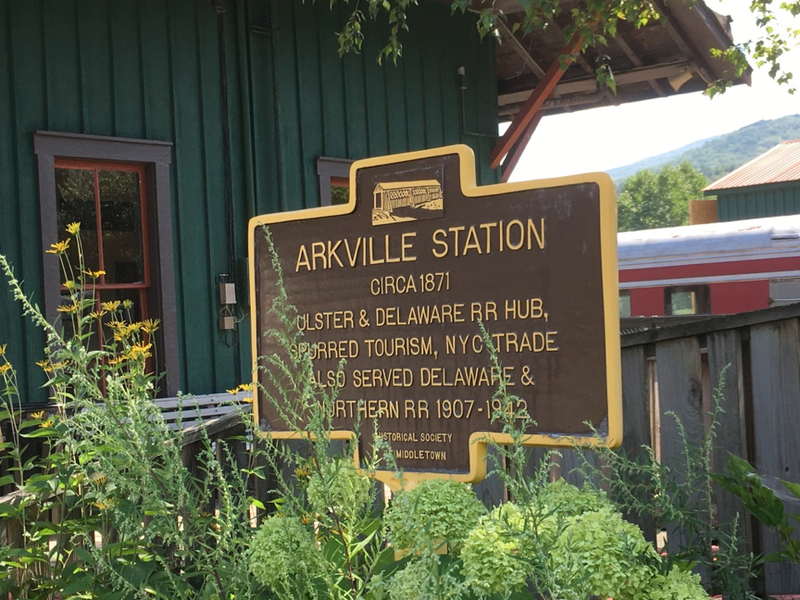 In 1864, one could purchase a 20 cent ticket and hop on the train in Adamsville (now Delmar) at 8:45 AM and arrive 15 minutes later in Albany. 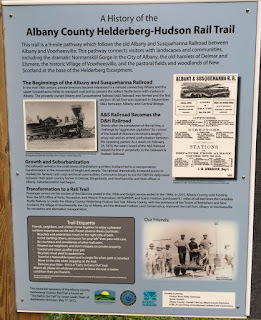 After business, shopping, and lunch, the train left Albany at 2 PM. 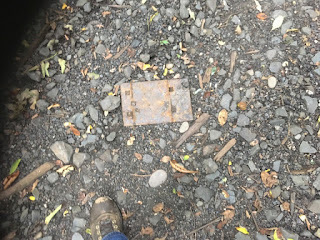 for the return trip―all without hitching up the horses and braving the roads. 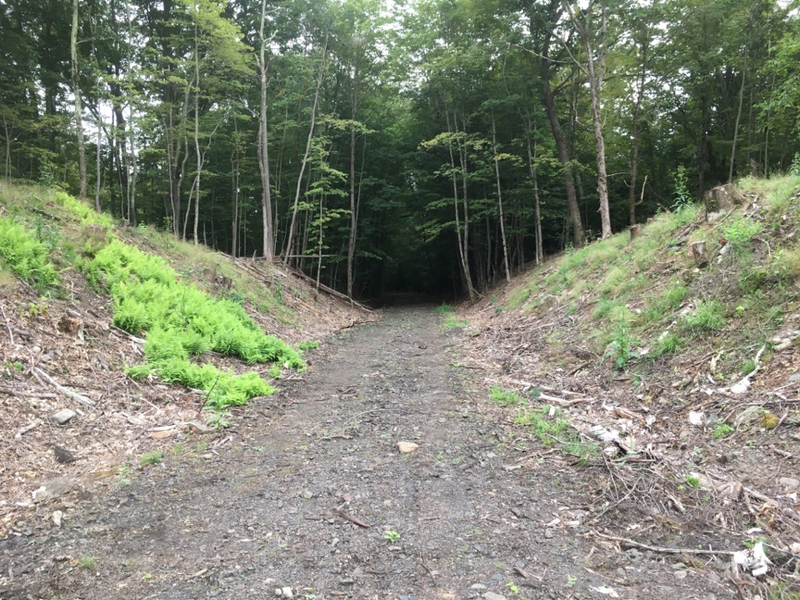 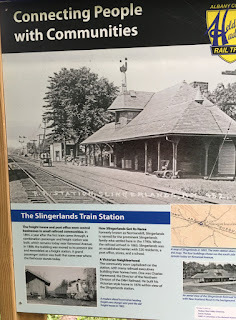 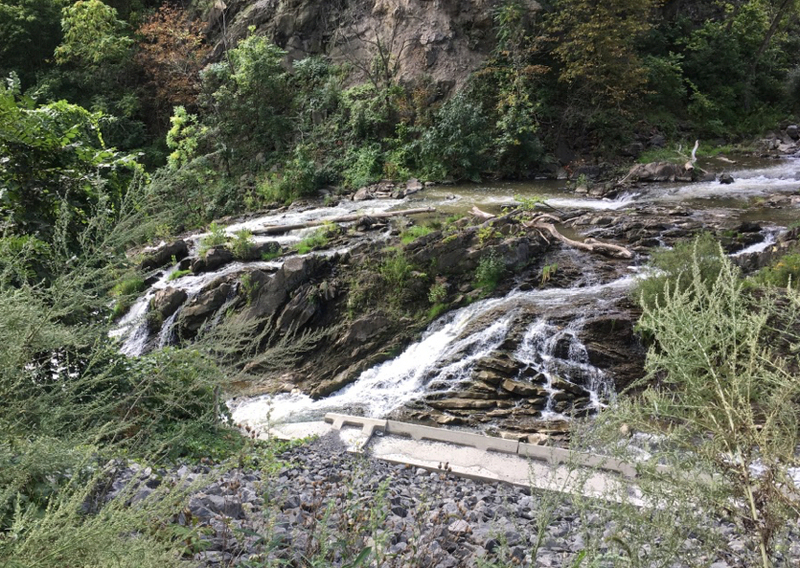 By December 31, 1868, the line’s 142 miles to Binghamton were completed.The line was built with 60-pound iron, and a six foot gauge enabling it to connect freely with the Erie Railroad in Binghamton. 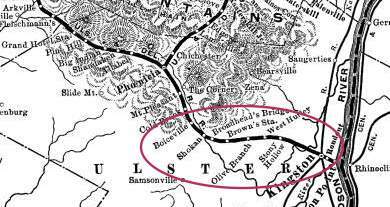 In the summer of 1869 there was a Railroad War for control of this important line. 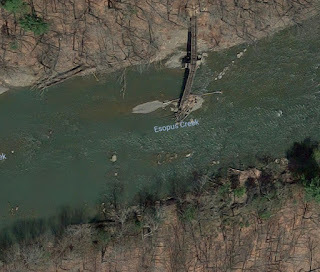 Read about it in either the Wikipedia link or the Susan Leath link below. 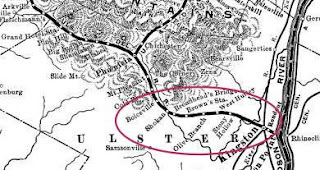 On February 24, 1870, the weary board of the A&S leased the line in perpetuity to the Delaware & Hudson. 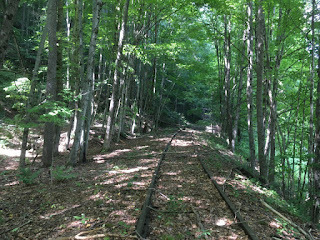 Passenger service on this section of the D&H line ended in the 1930s. 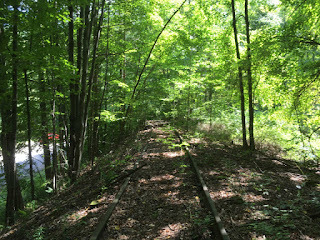 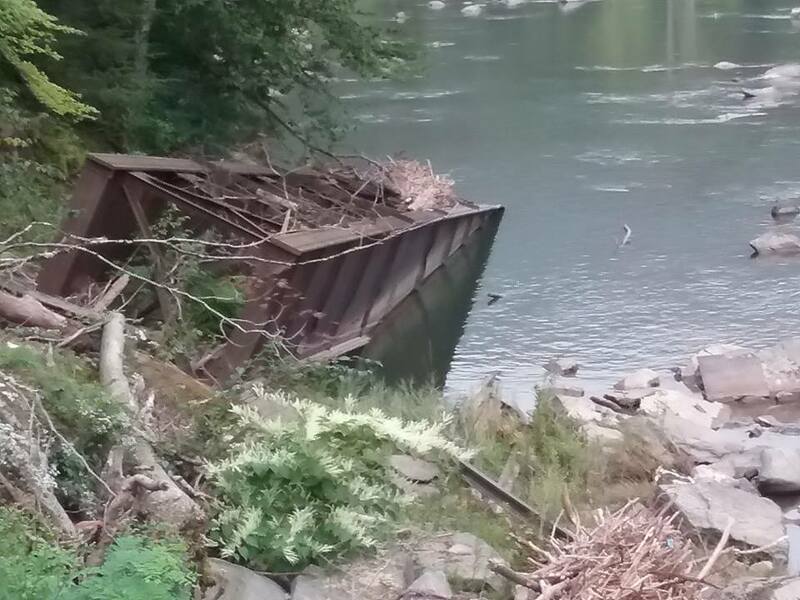 Freight service continued through the 1990s with the actual rails being removed in 2004. My plans were to head down to Stamford NY and spend the day riding the Catskill Rail Trail, but... it was hotter than hell! With temperatures in the mid 90s and lots of humidity it was a heat advisory day! 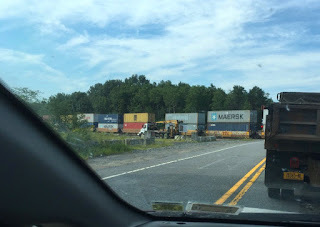 Interestingly, on the way, I had to wait for two long freight trains at a crossing. What I observed epitomizes the changes in freight trains since I was growing up. Rather than seeing a mixed consist of boxcars, flatcars and tankers, etc. 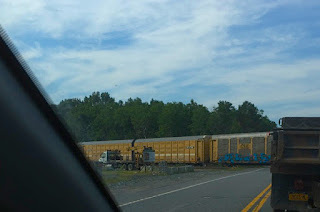 the first train was entirely containers and the second train was entirely automobile cars. The second train seemed to last forever and must have had 150 trains cars or so...Wow! 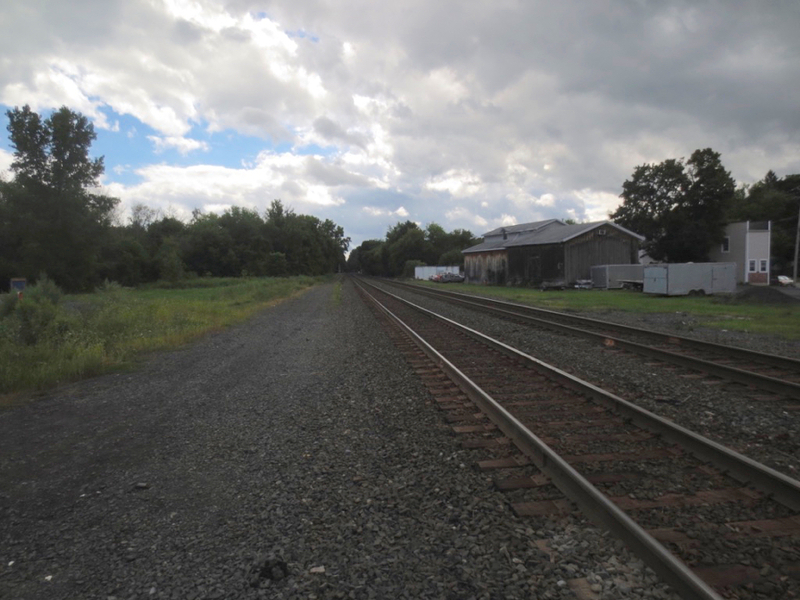 Stamford - Checked out the train station and the "overly sunny" ROW. 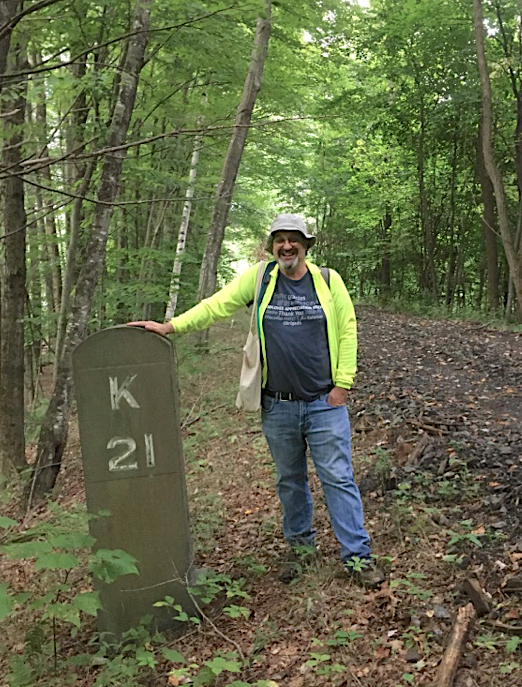 Drove to Arkvile - observed lots of nice grass-covered ROW paralleling the road to the east. Once I got Stamford--before finding the train station--I checked out the ROW going east and saw that it was primarily wide open... thru farm fields with little shade. 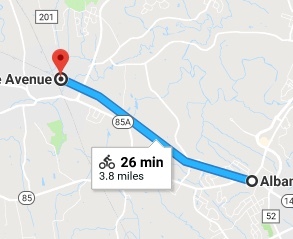 Once I found the station and stepped out for a short walk, I decided not to ride. It was hotter than hell - I am crazy but not suicidal! 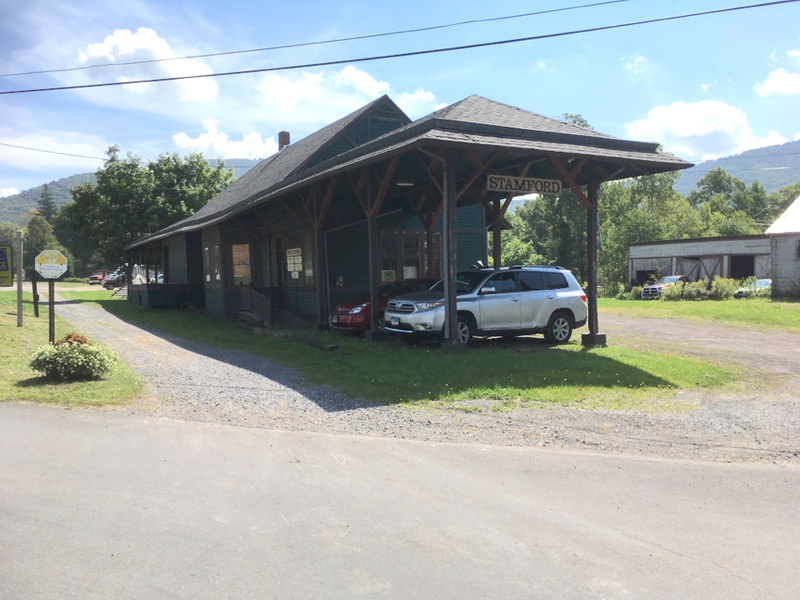 I drove on to Grand Gorge and headed south to Arkville. 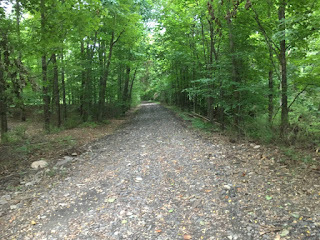 Along the road I did see the ROW and in may places it looked like it could be a shady, pleasant ride although its grass not gravel. 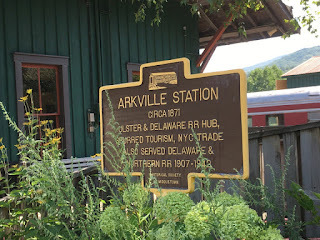 Arkville is home to of course the Delaware & Ulster Railroad - a scenic tourist train that embraces 26 miles of the former Ulster & Delaware ROW. They only run on weekends but I sauntered about the yard and was impressed - it looks like a successful business! 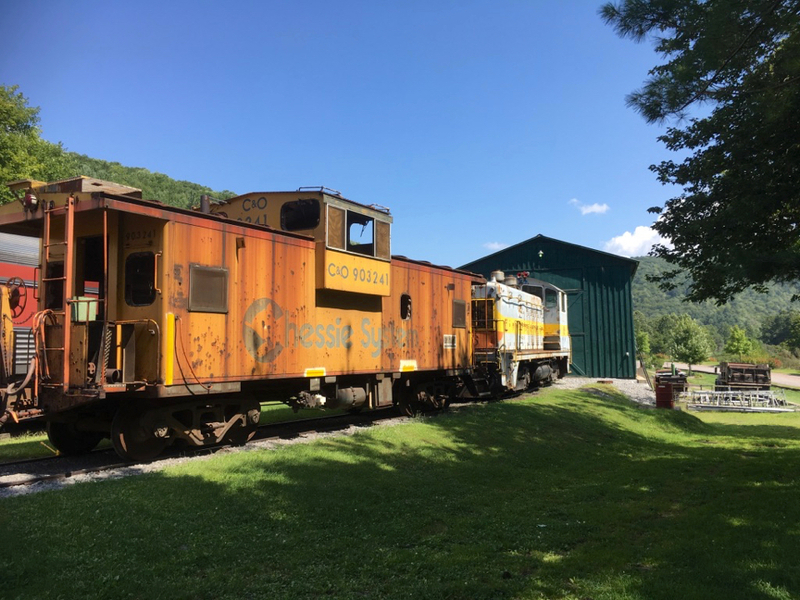 Never seen a "Boxcar Bathroom"! My last stop was a rewarding one. 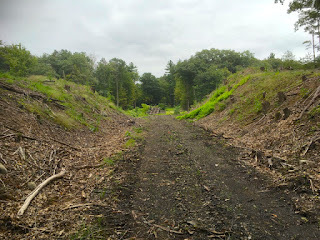 I even climbed up to the embankment to observe the rails still in place! 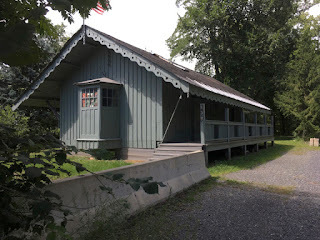 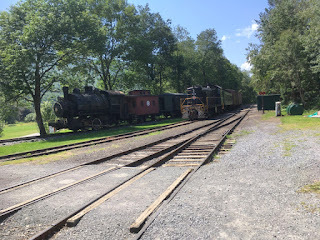 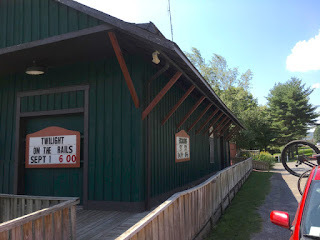 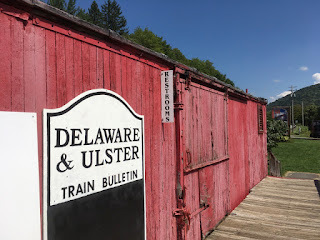 The Delaware and Ulster Railroad is a tourist railroad that started operations in 1983, between Highmount and Arkville, NY, and extended operations later to the Arkville-Roxbury, NY segment. 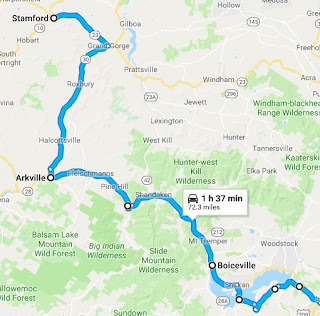 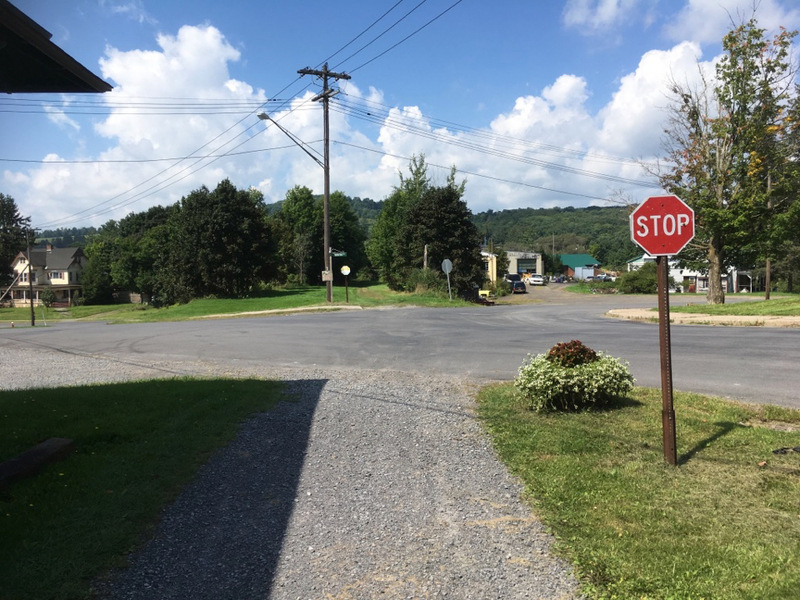 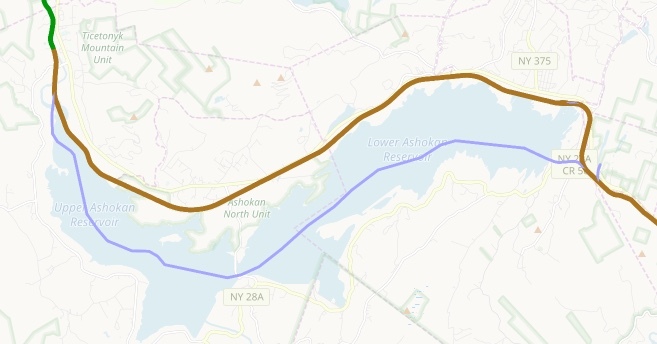 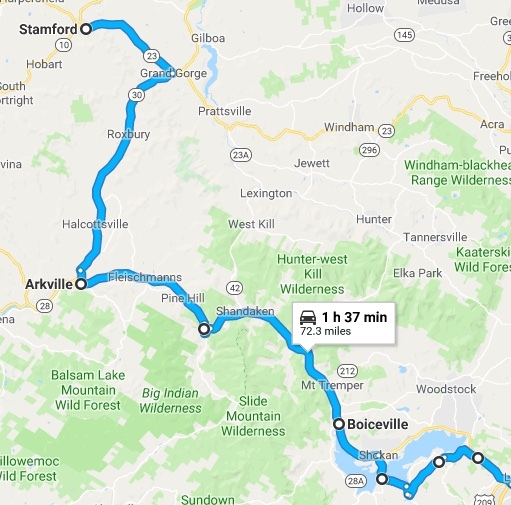 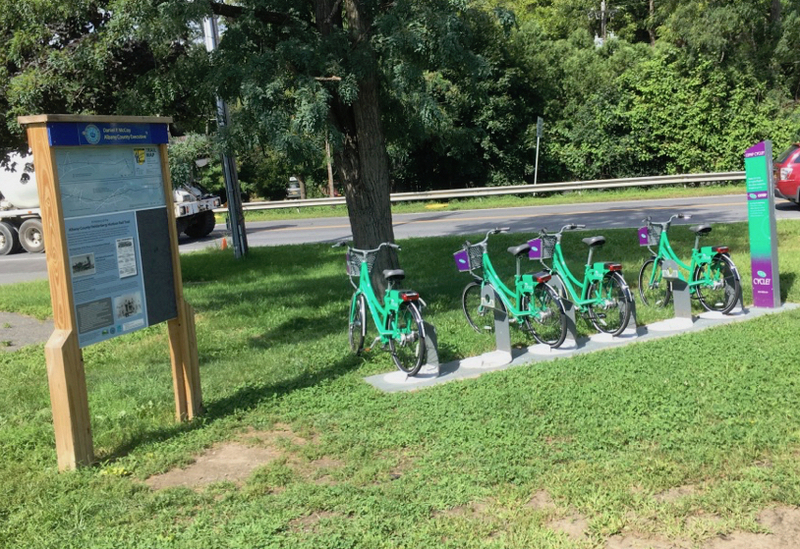 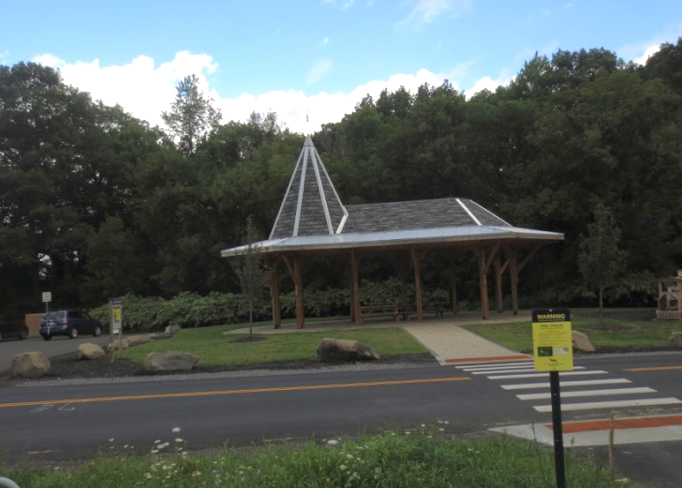 Round trips are 24 miles between Arkville, NY and Roxbury, NY and take approximately two hours to complete.